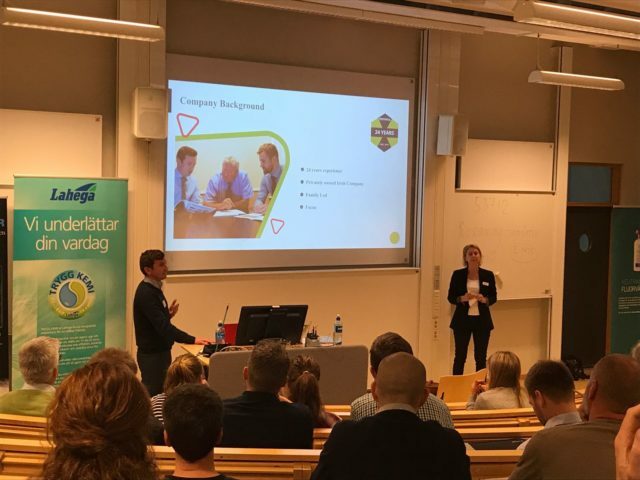 Chemstore were delighted to attend and present at the Chemgroup Scandinavia AB customer event at Jönköping University in Gjuterigatan, Sweden this week. A number of topics were discussed involving the chemical industry such as the importance of risk assessment and REACH regulations. Our Technical Director David O’ Carroll gave the attendees a comprehensive introduction to Chemstore, our core values, goals and value proposition as an organisation. This was an excellent opportunity to present the solutions we offer in the hope for future expansion into this market going forward. We would like to thank Pär Björklund and Hanna Björklund of Chemgroup for the opportunity to present Chemstore’s offering. This trip has allowed us to build our network and knowledge of the Swedish market. Exciting times ahead for Chemstore and Chemgroup working together.